The scratchings of Tel: Weddings, weddings ........ it's Spring ! It's that time of year, Spring is in the air and weddings are the business ! 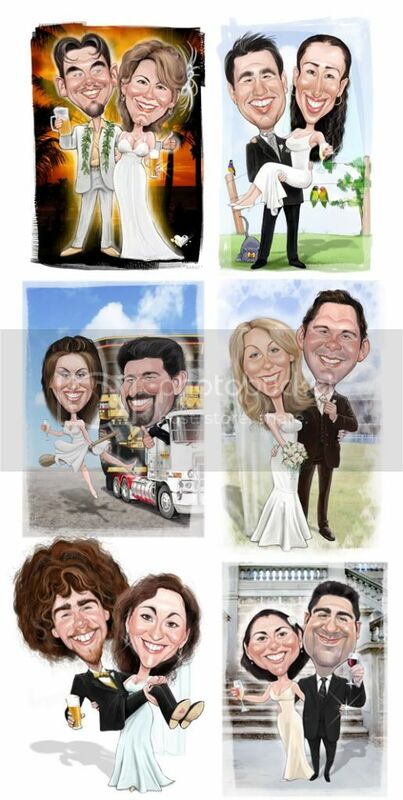 Collage of recent wedding commissions two of them I also attended and did live caricatures at the reception. I really must put together a formalised package for that and promote it. Cheers Matt appreciate that - they're a limited format, very 'safe' - but that's what they want ! Hey Elgin you say the nicest things .......... thanks for dropping by all the way from Nu Yaaawwwwk - appreciate it mate ! Hey thanks for that J Bosco - appreciate it !